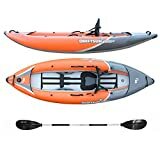 Rocker Profile – Created with a traditional river runner outline, this inflatable kayak can handle up to class III and IV rapids.High Pressure Drop Stitch Floor – Rivals the feel of a hard kayak, but much lighter! It provides rigidity, responsiveness and stability.Reinforced Layered PVC Construction – Provides a double layer of protection, allowing the kayak to safely bounce off rocks, logs and other whitewater obstacles without worries of damage.Removable Rear Tracking Skeg – Can be quickly detached for whitewater and storage (eliminating obstruction) or left attached for superior tracking performance in flat water. (7) Rapid Self Bailing Drain Plugs – Leave these ports open when navigating white water for quick and effortless draining of the cockpit. Leave closed when paddling flat water to stay high and dry. Inflated Dimensions: 8.5' ft. x 36" x 13"
Deflated Dimensions: 28"x 21" x 9"